We're sensing trouble. The 4-story, 40,000 square foot "green" office development proposed for the corner of Washington Place and Centinela is way behind schedule. 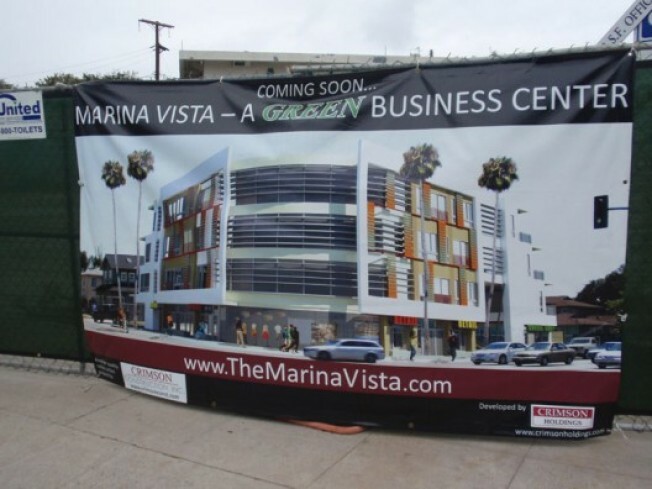 As the sign on the property notes, the project, known as Marina Vista, is scheduled for completion in Q4 of 2008. It's crunch time builders! If they can build a house in a day on that one show with that annoying guy, surely somebody can build this thing in a week or two. The Marina Vista web site touts the use of solar technology, natural light, and the reuse of a brownfield site all aiding in the development of an attractive green development. The Loopnet listing for the project shows a bevy of office opportunities still available.